It was through Geoff Walden's site Third Reich in Ruins that inspired my first trip through Germany in 2007, and in particular his section on Oberschleissheim in which he shows the following photograph of his father- 2nd Lt. Delbert R. Walden, who was stationed at the Oberschleissheim Airfield with the 344th Bomb Group in 1946 after it was occupied by the U.S. Army Air Forces in April 1945- posing "in front of the adjacent Schleissheim Palace (which had suffered bomb damage during the war)." His outstanding site built itself from the photos taken by his father whilst stationed in Germany as part of the Army of Occupation from December 1945 to July 1946. I therefore went to Dachau with Goring. We had the impression we'd fallen into a bandits' lair. Their first concern was to ask us for the password. We were led into the presence of a woman. I remember her, for this was the first time I saw a woman with her hair dressed like a boy's. She was surrounded by a gang of individuals with gallows-birds' faces. This was Schäffer's wife. We drove the bargain, although not without my warning them that they wouldn't see the colour of my money until the weapons were in my possession. 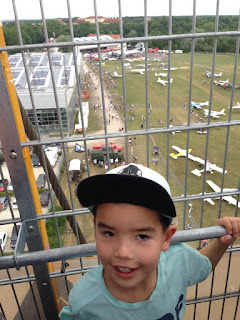 We also found, on the airfield at Schleissheim, thousands of rifles,mess-tins, haversacks, a pile of useless junk. But, after it had been repaired, there would be enough to equip a regiment. From a 1937 postcard. The New Palace was begun under Max Emanuel in 1701-1704 from designs by Henrico Zuccalli and completed from 1719 by Joseph Effner. Of the originally planned, monumental complex consisting of four wings, only the main wing was completed. The result is nevertheless an outstandingly beautiful Baroque palace. 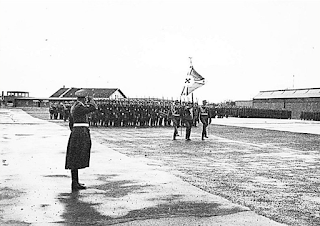 In 1912 the airfield beside the palace was built, which is the oldest active airfield in Germany. 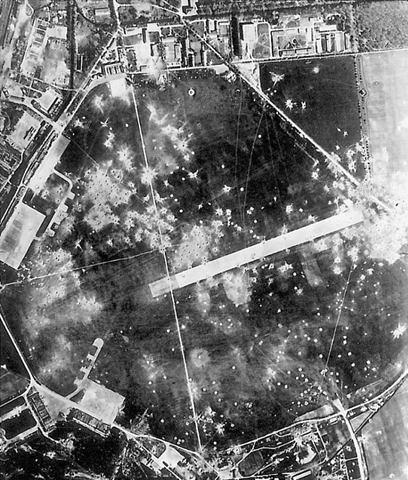 In the Second World War the air base was heavily bombed, which also led to considerable damage in the area and the schloß. 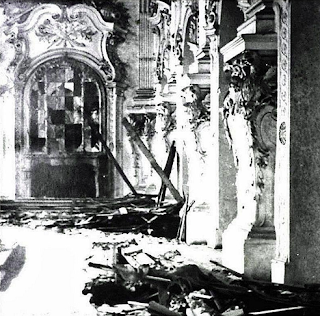 The Altes schloß suffered severe damage during the war and was still in a ruinous state decades after the end of the war. A restoration took place from 1970 onwards, but not all of the historical interiors have been restored, but some of them have been modernised for museum use. 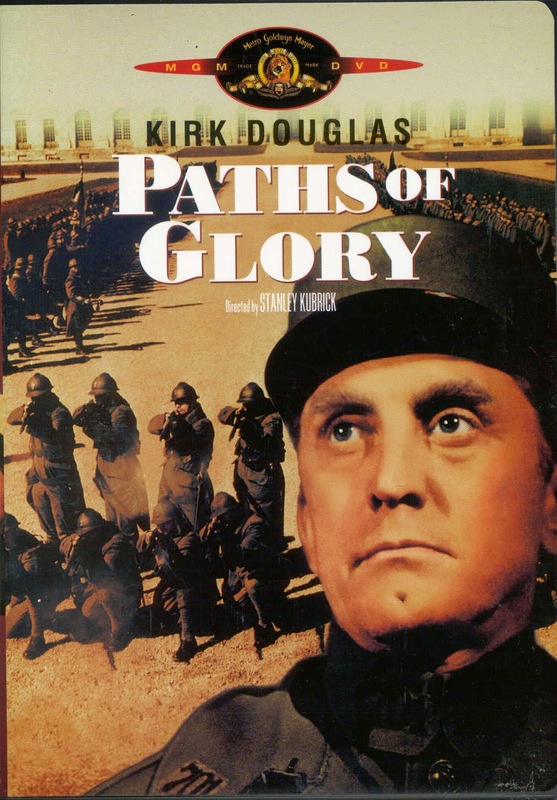 Kubrick's 'Paths of Glory' with Kirk Douglas was shot at Oberschleißheim, with the schloß serving as the French Army Headquarters. 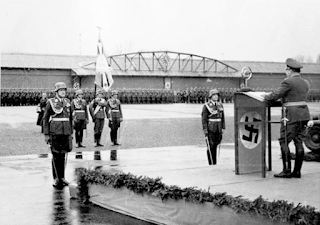 The soldiers were supplied by 9, 733 conscripts who had been born in 1937. The court martial in the Great Hall (Grosser Saal) inside the Palace. 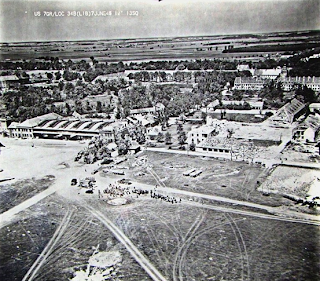 The execution of the WWI French soldiers was filmed in the grand garden of the new Palace (Gartenfassade des Neuen Schlosses). 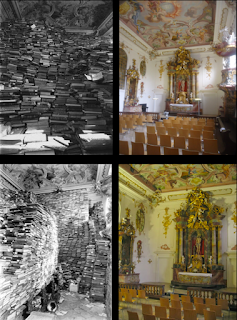 The Großer Saal before and after the war, heavily damaged, and today with the wife. The room serves to glorify Max Emanuel as elector and victorious general against the Turks. On either side of the room are two paintings by Franz Joachim Beich showing the military exploits of Max Emanuel. The stucco decoration by Johann Baptist Zimmermann featuring draperies, weapons and trophies date from 1722. The ceiling is by Venetian Jacopo Amigoni showing the "Battle of Aeneas and Turnus for the hand of princess Lavinia" from which Aeneas emerges victorious; a metaphorical nod to Max Emanuel. Before the war and today, extensively renovated. The magnificent interior decoration was the work of well-known artists such as Johann Baptist Zimmermann, Cosmas Damian Asam and Jacopo Amigoni. The Gallery Rooms contain masterpieces from the European baroque era. The wife above the main staircase, shown then and now. This is architecturally the most significant area of the schloß and owes its inspiration to Henrico Zuccalli who created a division of stairways and landings within a high wide hall, which was soon recognised as exemplary and which would inspire Balthasar Neumann when he designed the staircases for the palaces at Brühl and Würzburg. The dome fresco by Cosmas Damian Asam shows the representation of Venus in the Forge of Vulcan, in which the weapons are made for her son Aeneas. Again, Aeneas in the baroque pose with periwig bears unmistakable traits of Elector Max Emanuel. This presentation was the first secular theme painted by the famous Bavarian fresco painter Asam and finds its thematic continuation in the ceiling paintings with scenes from the Trojan War (according to Virgil's "Aeneid") in the neighbouring ballrooms. 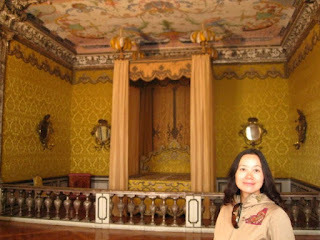 The bedroom of the Electress Maria Amalia, wife of Elector Max III Joseph, known as the "Yellow Apartment." The wife in the Halle im Erdgeschoss whilst outside the Western door, produced by Franz Ignaz Günther, shows how much has been reworked since reconstruction around the door as the lion has since lost his sword. 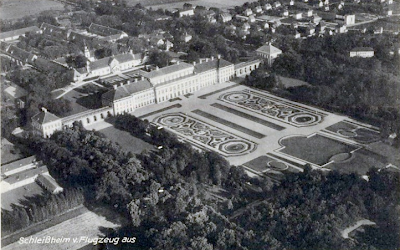 The Altes schloß before the war on the left and in April 1945 on the right. This building began in 1598 as a renaissance country house and hermitage founded by William V close to Dachau Palace. The central gate and clock tower between both courtyards still date back to the first building period. The inner courtyard is called Maximilianshof, the outer one Wilhelmshof. Under William's son Maximilian I the buildings were extended between 1617 and 1623 by Heinrich Schön and Hans Krumpper to the so-called Old Palace. The rooms were decorated by Peter Candid. Maximilian's son and successor Ferdinand Maria died here in 1679. After heavy destruction in the Second World War the palace with its spacious buildings was reconstructed as shown here. Most of the stucco decoration of the chapel Wilhelmskapelle has been preserved. The canal with the Lustheim behind, then and now. The Lustheim was built by Enrico Zuccalli as a garden villa in Italian style in 1684-1688 for Maximilian II Emanuel and his first wife, the Austrian princess Maria Antonia. It lies on a circular island at the end of the baroque court garden. The interior is dominated by the large banqueting hall in the middle of the building. The frescoes were done by Johann Anton Gumpp, Francesco Rosa and Johann Andreas Trubillio. Since 1968 the palace has housed a grand collection of Meissen porcelain, only outranged by the Porzellansammlung in the Zwinger, Dresden. The palace once formed the centre point of a semicircle of round buildings. Two pavilions still exist: To the south of Lustheim Place the Renatus Chapel was erected in 1686 by Zuccalli in a pavilion. The northern pavilion houses the decorated stable which was built for the favourite horses of Elector Max Emanuel. 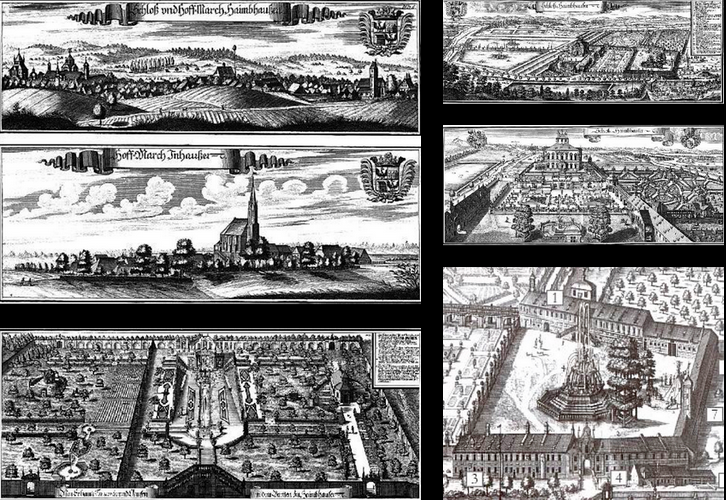 The baroque court garden, laid out by Dominique Girard and others, is still largely in its original form. The Schlosswirtschaft (palace restaurant) on April 1, 1937 during the commemoration of the air field's 25th anniversary with high-ranking Nazi officials and its façade today. The Schloßwirtschaft Oberschleißheim Biergarten is located on the palace grounds, with seating for 1,000 and its roots trace back to 1597, when the founder of the Hofbräuhaus brewery retired to a farm there. 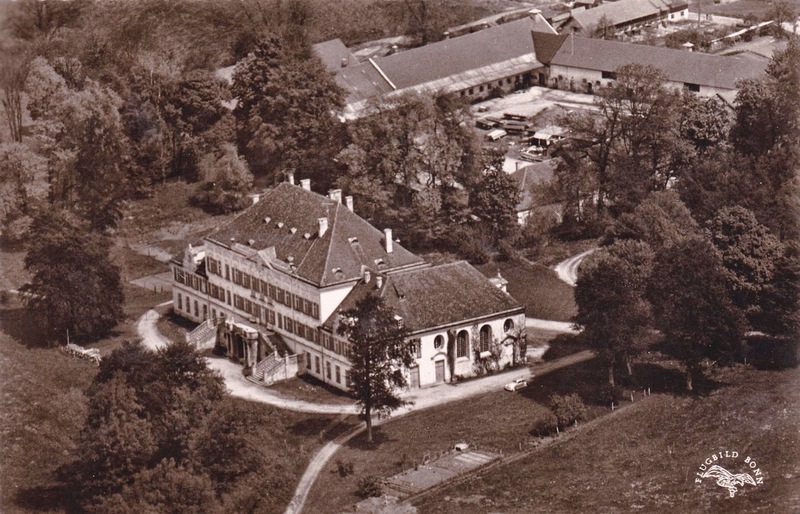 Following the building of the New Schleissheim Palace in the 17th century, the Schloßwirtschaft provided catering to its workers and servants. 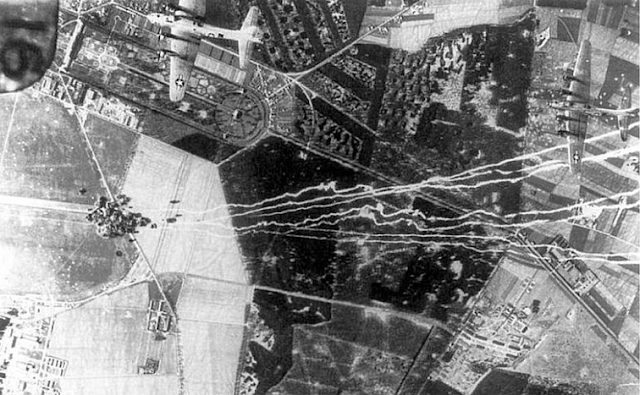 Hochmuttinger Allee being cleared in 1935 to further extend the airfield eastwards. army personnel file records that on 7 May he joined a volunteer unit of Epp’s Freikorps; left it on 15 October; was temporarily recruited by the local airfield at Schleissheim on 29 March 1920; flew an aeroplane to a Bavarian unit stationed in the Ruhr on 6 April; and finally resigned his commission in Munich on the last day of April 1920. In 1281 schloss Haimhausen was listed as a castle (castrum) in a gazetteer of Upper Bavaria. It was destroyed in the Thirty Years War and rebuilt in 1660 as an ornate Baroque structure by Andreas Wolff. In 1747 and ensuing years, Francois Cuvillies the Elder enlarged the villa by seven bays on each side and added two wings. The external form of the house, with the high roof typical of the region, has remained unchanged to this day. Cuvilliés was also responsible for such famous buildings as the Munich Residenz (royal palace), the Residenz Theatre, the manor Amalienburg in the grounds of Schloss Nymphenburg, and rooms in Schloss Brühl, near Bonn. 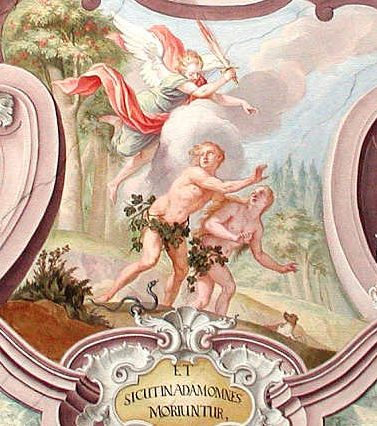 The ceiling murals in both the Golden Room and the Chapel were executed by the famous Augsburg artist, Johann Bergmüller in 1750. 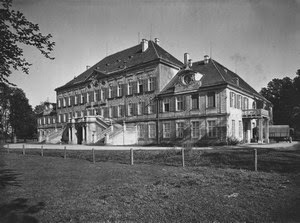 Haimhausen Schloss became the property of the family Butler v. Clonebough (called Haimhausen), after having been awarded to the Irish officer Walther Butler (known as the "Wallenstein murderer") in thanks for his fulfilling a contract to deliver Wallenstein "dead or alive" on February 25, 1634. Friedrich Schiller immortalised Wallenstein in the dramatic trilogy that bears his name (completed in 1799). He did not enjoy his success for long, passing away in 1635 after being wounded. The property was then passed from generation up until Theobald, who had a close relationship to Count Stauffenberg, fled in March 1945 by carriage to Neubrandenburg to rescue his wife and three children from the advancing Russian troops, but was too late. Supposedly he poisoned his wife, then his 3 children, then set his house in flames, and shot himself. So ended the line of the Counts of v. Clonebough gen. Haimhausen on 29 April 1945. 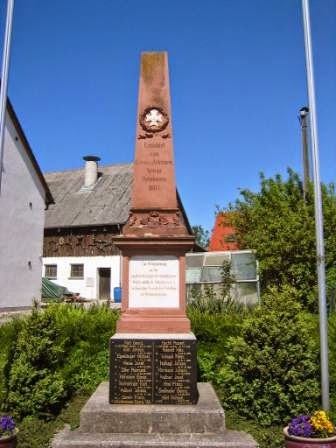 The war memorial on the high street is flanked by two flag poles, neither of which can hoist the flag under which those commemorated died for. Bavarian International School's chapel then and now. It owes its splendour to its ceiling painting, again by Bergmuller- the Salvator Mundi, dated 1750- as well as the delicate Rococo stucco work by Verhelst. Directly above is this fascinating representation of the return of Christ on the throne 0f the Trinity; the largest Salvator Mundi of its kind in which God holds the Flaming Sword of Judgement and has the left hand on the empty seat to his right whilst in the centre a kneeling Christ with the cross rises over a world in flames, depicting the four continents known at that time. 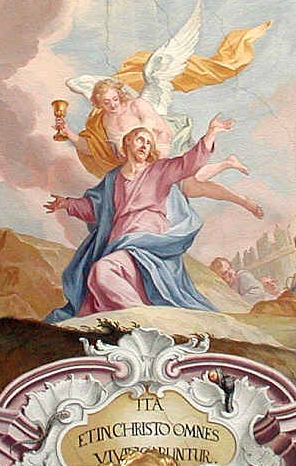 But what makes this painting remarkable is the representation of the Holy Spirit in human form. This is expressly forbidden by the Catholic Church, as Pope Benedict XIV declared in October 1745 just before this painting was created, and and today is only permitted in the form of a dove. As a (Catholic) colleague remarked upon entering, "God is not present," noting the lack of a sanctuary lamp. 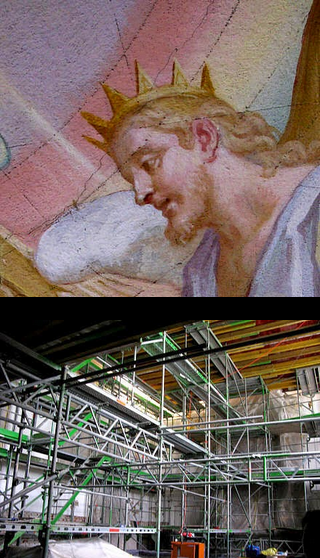 On the right is a close-up during the 650,000 euro renovation of the chapel completed in 2010. An interesting touch on the ceiling is the expulsion from Paradise, showing Adam and Eve being followed by a dog and snake hopping along, and at the other end above the altar Christ on the Mount of Olives, with the snake making a reappearance with apple in mouth. 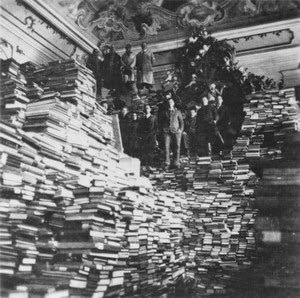 1949 photos of the thousands of books from the Bayerischen Staatsbibliothek that were stored for safety in the Haimhauser Schlosskapelle in today's Bavarian International School during the Second World War. 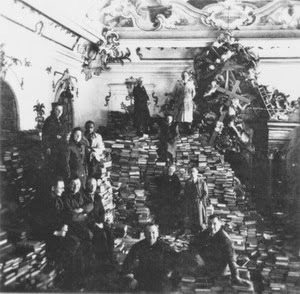 During the 1944 bombing, the library's collection was distributed throughout 28 sites in Oberbayern. Moving the books postwar back to the Staatsbibliothek on Ludwigstraße showing the necessity for having relocated its collection. Between 1949 and 1975 the Schloss was used by the Bavarian Legal Aid School and later the Munich Police Academy. 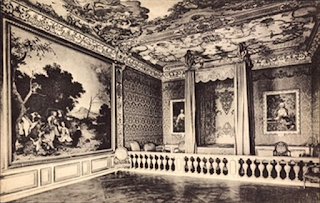 Between 1976 and 1986 the International Antiques Salon occupied all rooms with its period exhibits. 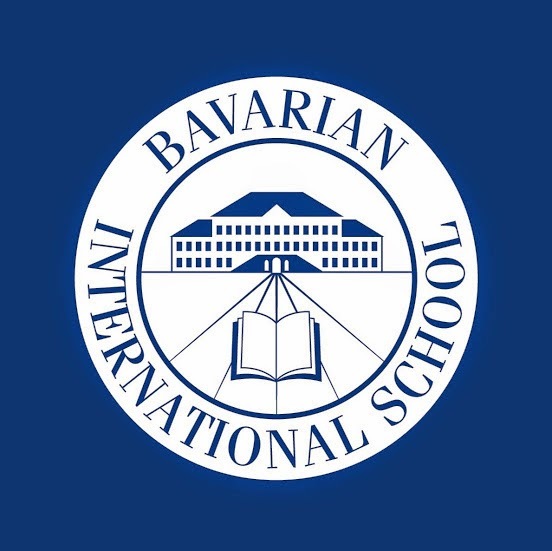 The role the schloss played in preserving its past and passing it on to future generations free from war and violence makes Bavarian International School's logo particularly resonant. Bavarian International School's 'Golden Room' today. This banqueting hall, with its ceiling painting of The Four Seasons by Bergmuller (dated 1750) and its two rare Nymphenburger porcelain stoves, forms the visual climax of the state apartments of schloss Haimhausen.